So this would be my 5th revision so far of my personal site. I’m pretty happy with it. It’s pretty good. I’m sure I’ll get annoyed by parts of it later and by the time it’s ready to be replaced, I’ll hate it. Still it is one step in a series of site designs of… dubious qualities. Lets take a moment to look back at what once was. I always love looking back at my old work, both to cringe and to feel a sense of improvement. Each of these designs, no matter how awful they might look in retrospect, felt awesome at the time and it’s that desire to have something I’m proud of that keeps me going! Almost there! A friend described the theme as “Beautifully unpolished, like IWBTG”. I think I had the right idea, but it just simply did not come together. The pixel elements were far to big and it really crippled the design. Also, alignment issues everywhere. I was really happy with it, but it just didn’t quite mature. The Pixel fonts for titles and headers just clashed too hard. It went a little too pixely. Also in an attempt to “keep it clean” I made cut out too many features. I think if I had a better idea how the theme would ultimately turn out, I’d have been able to get it right. I miss some elements already.  I might try and inject some pixel elements into the new layout, but if I do so, I have to do it carefully to avoid repeating my previous sins. Also: First time I bothered to not just use “system” for a pixel font. I have uncanny fondness for this design. I think it was the first thing I did that looked kinda nice. It’s of course, flawed to heck. The “Web 2.0” glass thing is played to the point of glaring fault. The header ALMOST is super cool, but the transparency stuff muddy it and the fonts for the link bar are wrong. Also big, bezely menus. If I made that work for the post boxes though, it might have sorta came together. It was fun to go crazy with all the glassy elements though. I don’t HTML and CSS support is where I wanted it to be to do what I wanted to do yet though. A better designer could have pulled it off, but back then I was having trouble just keeping elements lined up cross browsers. Basically a header on top of an iframe to a coppermine gallery (and a few other assorted pages). I think I got fed with my “complex” first website and just wanted a place to dump art. 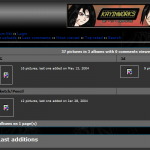 Eventually it was upgraded to have a small wiki installation as well. Very “function” over form. Also the only design I need to use archive.org to find. All that said, I remember a friend at the time saying my site was refreshingly simple and easy. 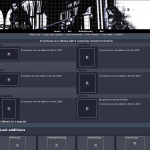 I don’t remember what other sites looked like then, but I think I was trying to be modern with the really big, whited out header. 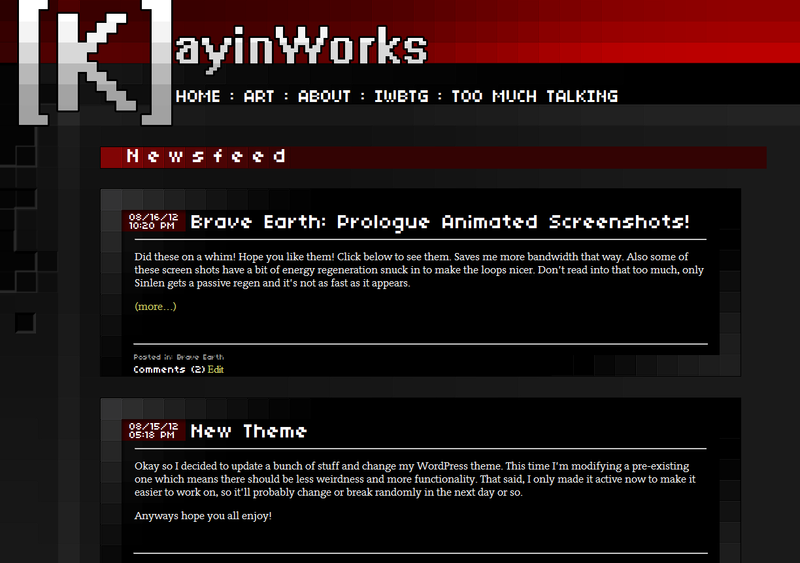 The design lasted for quite awhile, mostly out of apathy and was only replaced with a formal blogging engine because of IWBTG and the fact that people might actually start snooping around “kayin.pyoko.org”. Also, first appearance of the bracketed K! 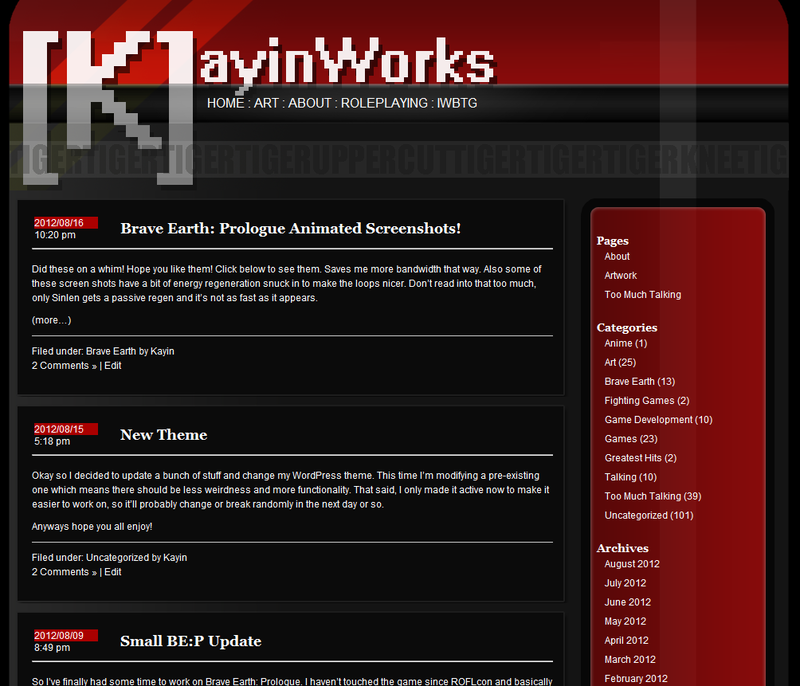 Also first occurrence of Kayinworks. 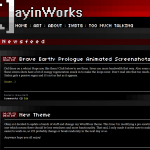 ← Brave Earth: Prologue Animated Screenshots! This new layout is horrible. 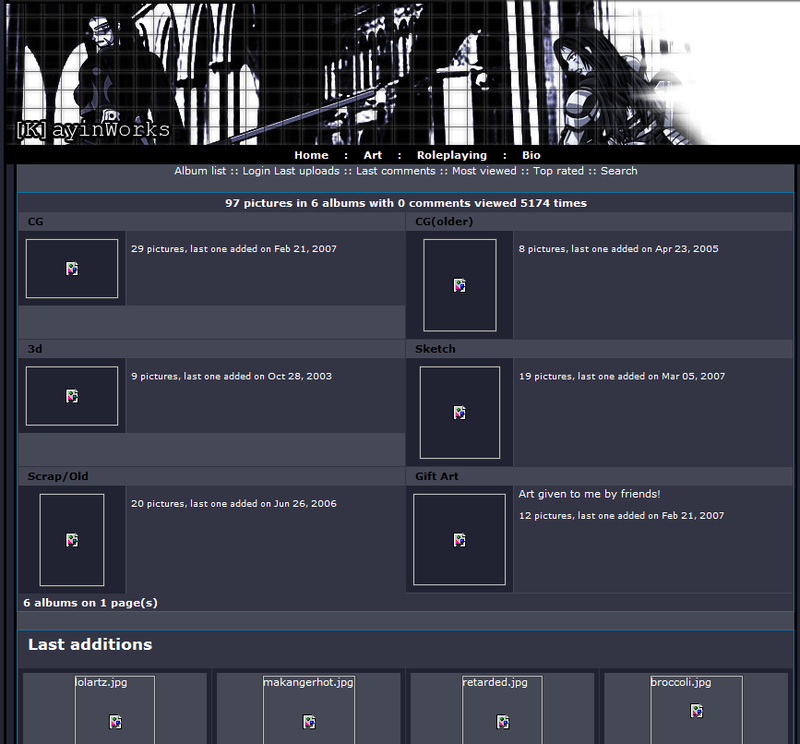 Your old layout was clean, too-the-point, and purposefully retro-looking. And was a hell of a lot better. You are sooooo outvoted on this one.